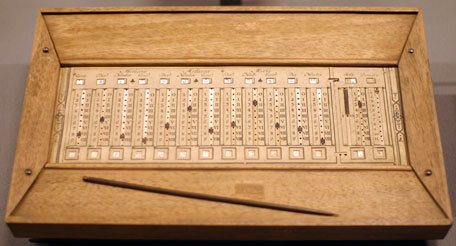 The adding device of Caze, created sometime around 1696, could be considered as one of the most simple calculating devices, which can be invented, something like a version of the abacus or a simplified version of the Abaque Rhabdologique of Claude Perrault. In the years 1704-1708 Caze corresponded on the topic of calculating devices, including his own, with Leibniz. The device was mentioned for the first time in the second 1707 issue (May-August, 1707) of the french journal Nouvelles de la république des lettres, published in Amsterdam (see the nearby image). In the journal, in the paragraph for Arithmetic, after mentioning the invention of the binary arithmetic by Leibnitz, it is said that Mr. Caze created and demonstrated to the public rather curious Machine. And that's all! In 1711 Caze obtained a patent for his calculating device. We don't have any reliable information about the creator. According to my personal investigations, the author is most probably the Frenchman César Caze, a rather interesting person (see biography of César Caze). César Caze was a French Protestant, who in 1682 escaping from persecution, emigrated to Amsterdam, Netherlands, where he lived until his death in 1720. In Amsterdam Caze worked mainly as a maker of glasses, but remained known also for his scientific interests and busy correspondence with Leibnitz, as well as for his dissertation on the use and improvement of arithmetic from the beginning of XVIII century (Amsterdam, August 1711, The invention of calculating machines and a dissertation on the use and improvement of arithmetic). The adding device of Caze, shown in the photo bellow, is manufactured in 1720. There are 3 copies with different dimensions and materials used in the collection of CNAM, Paris. Dimensions of one of them are: 3 cm x 18.5 cm x 29.6 cm, weight 310 g. Materials used are: wood, cardboard, paper, brass and textile. It consists of movable rulers (bars) with inscribed digits, which can be seen in windows. The upper row of windows (over the rulers) is used during adding operations, while the lower row (its digits actually are complement to 10 of the digits in the upper windows)—during subtraction. The device doesn't have tens carry mechanism. The rightmost 3 rulers are used for adding of sols and deniers (french monetary units at this time, 1 sol is equal to 1/20 of the livre, 1 denier is 1/12 of the sol). Next 12 rulers are decimal and can used for adding up to hundreds billions. The rulers are moving by means of a wooden stylus. 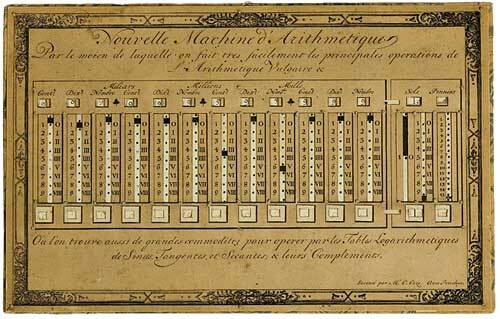 The advantage of such device is quite questionable, but nevertheless the machine of Caze gained some popularity in the beginning of 17th century under the bombast name Nouvelle machine arithmétique de Caze (The New Arithmetical Machine of Caze). Similar devices will be invented many times during the next two centuries after Caze, for example the device, invented in 1846 by Heinrich Kummer. The device of Kummer however is capable to perform carries from one column to another.